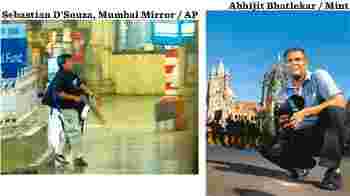 Iconic image: Sebastian D’Souza’s photo of Ajmal Kasab at Mumbai’s Chhatrapati Shivaji Terminus got a special mention in the Spot News category at the World Press Photo award; and (right) D’Souza. Mumbai: Not everything in the photograph is, at first, immediately clear. The shop in the deserted background has been reduced to a yellow-and-green matrix formed by the hanging packets of potato chips. The advertisement for HDFC Standard Life is too awash with light to read easily. Even the gun is really just an elongated, metallic blur; we infer that it is a gun because we know who is holding it. Only its owner has been caught in sharp relief, his face composed but his stride reeking of the braggadocio of a young man who knows that a city, at least for the moment, is cowering before him. D’Souza, a spry 56-year-old, is the photo editor at the Mumbai Mirror, a newspaper housed in The Times of India building—so close to the terminus that last 26 November, he could hear a grenade go off even as he sat in his office. His team was already preparing to leave for the Taj Mahal Palace and Tower, from where rumours of a shootout had filtered into the newsroom. When he heard the explosion, D’Souza grabbed his backpack and sprinted towards the terminus, slipping in just before the police cordoned off the area. Another photographer, Rajnish Kakade of Associated Press, recalls that he wasn’t quite as lucky: “My office is a little further off. I was just 15 minutes too late." For the next 40 minutes, D’Souza played an intricate game of cat and mouse, hiding behind pillars and in shadows, sneaking through the carriages of stationary trains, chasing after the indistinct figures of Kasab and Abu Ismail. At times, he ran into knots of crouching policemen, all reluctant to open fire. He saw the owner of a bookshop gunned down mere metres away, one hand still clutching onto the stall as he fell. “Kasab heard the sound of my camera, but every time he looked my way, I ducked," he says. “At some point, I realized I was wearing a light-coloured T-shirt, and that if I moved too much, they would see me. Something told me to run away." In all, D’Souza took at least 100 photos, not once looking down at the viewfinder of his Nikon to see what he’d captured. “I’d been in the riots in Mumbai and Gujarat, but I don’t think this was as dangerous as a riot," he says. “Here you knew there were two men. In a riot, you don’t know who will come after you to kill you." Only after the pair of terrorists left the station and the police crept back in to assess the damage did D’Souza look through his pictures. “The famous photo was the sharpest of the lot," he says. “But there were other photographers, and I thought they would have gotten some photos too. Later I’d ask them: ‘Where were you guys? You shouldn’t have been afraid.’"
Finding himself barred from the terminus, Kakade had made his way to the Taj, where he spent the night and most of the next two days. “I met Sebastian when he came to the hotel at 5 the next morning, but it was only around 8:30 or 9 that I saw his picture in the paper," Kakade says. “It was so clear. It showed his presence of mind—it was shot cold-mindedly. Even then I thought it was a candidate for the World Press Photo award." He was right; it would win a special mention in the Spot News category. D’Souza’s photo is particularly gripping as a capsule of incongruity. “We usually have images of a terrorist that conform to a stereotypical idea," says Devika Daulet-Singh, director of Photoink, a New Delhi-based photo agency. “This guy looks like a college student—he could be anybody. It shakes up all your ideas. More importantly, you actually got an image of the attack. Usually, when something happens, say in Kashmir, you maybe get images of the bodies later, if that. This was live." Even before the terrorist assault on Mumbai ended, D’Souza’s photo had appeared in publications around the world, but it would be another seven months before he saw his subject again. In June, D’Souza appeared at the Arthur Road court house to testify against Kasab. “He had lost all his musculature," he remembers. “Earlier he had looked firm and trim. Now he looked softer." Copies of D’Souza’s photos were handed around the courtroom, and as Kasab looked at them over his lawyer’s shoulder, D’Souza remembers, “something happened to him. He looked ill. He put his head down on the desk, and then he told the judge that he wanted to go back to his cell, that he wasn’t feeling well". The judge disregarded that request. “So Kasab started crying. Seeing those photos, he must have felt something." The cross-examination of D’Souza was brief. “Kasab’s lawyer asked me if I knew what ‘morphing’ meant. He was trying to trap me," he says. “I replied: ‘It’s the first time I’m hearing the word. You tell me what it means.’" But his cheekiest, most pithy response had come at the very beginning of that trial session. Asked, as a matter of formality, if he recognized the defendant, D’Souza looked directly at Kasab and said: “His photo made me famous. How could I forget?"